Shazard Mohammed, Senior Manager, Credit Card Centre, Republic Bank Limited, right, was made an honorary Hillview Renegade after his company’s commitment to impacting social change and cricket development through the Ross Cup T20 tournament. 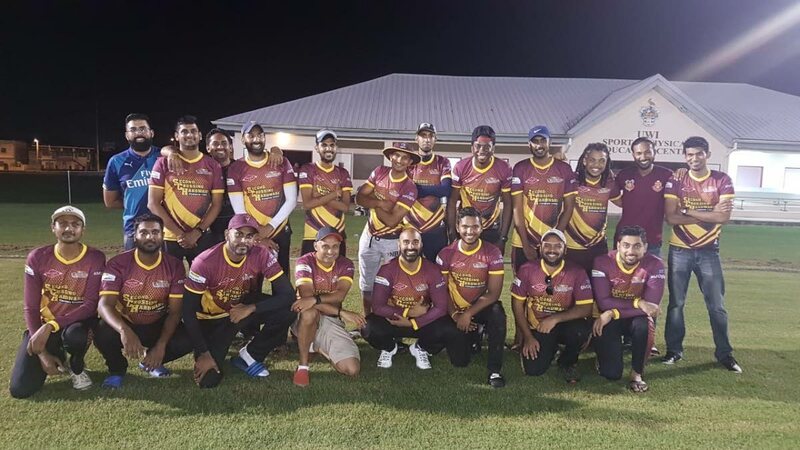 FULL OF Vybz edged SFBT Ball Tamperers by four runs on Saturday, on the opening day of the Ross Cup T20 Tournament, at the Sir Frank Worrell Ground, UWI St Augustine campus. In the other game of the double-header, Lab Medica Square Cutters earned a five-wicket win over Hillview Renegades. This inaugural tournament involves teams that feature past students of Hillview College, Fatima College and Presentation College in Chaguanas. In the day’s opener, Full of Vybz, who were sent in to bat first, posted a score of 139 runs for eight wickets in their allotted 20 overs. Aleem Gaffoor had a top-score of 40 while Nigel Boodoo contributed 28. Rishi Ramgoolie took three wickets for 13 runs and Timothy Harris collected 2/28. Ball Tamperers, in response, were dismissed for 135, with four deliveries remaining. Mohsin Nana and Dave Boodoo each scored 33 for Ball Tamperers. Bowling for Full of Vybz, Emir Gaffoor got 3/17 and Josh Jagmohan 2/31. In the latter fixture, Hillview Renegades were restricted to 106/6 with Raj Ramkissoon getting two wickets for 18 runs. The leading scorers for Renegades were Varindra Jagrup (30) and Dave Ramdial (29). Ronaldo Huggins struck an unbeaten 46 as Lab Medica Square Cutters reached 109/5 in 14.2 overs. The second round of games will take place this Saturday, November 10, with Full of Vybz facing Lab Medica Square Cutters at noon, followed by the fixture between SFBT Ball Tamperers and Hillview Renegades at 5 pm. Reply to "Full of Vybz edge Ball Tamperers at Ross Cup T20"